One of the books that has heavily influenced our current diet and lifestyle is The Primal Blueprint by Mark Sisson. Sisson is the creator of the popular blog, Mark’s Daily Apple. In October of 2009, I was diagnosed with Adrenal Fatigue (more to come on that in a later post). Part of the treatment protocol was decreasing blood sugar spikes and dips throughout the day. That meant no more cereal, oatmeal, or toast for breakfast. Eggs, meat, or dairy and vegetables were the recommended replacements. My doctor also told me to decrease high carb/high GL foods at lunch, as well as in the afternoon when I frequently snacked on crackers and sometimes even a cookie! What was I going to eat! I came home from this appointment with my holistic physician and discussed the diet recommendations with Alex. A few days later, Alex discovered The Paleo Diet for Athletes and The Primal Blueprint. He was vaguely familiar with the paleo diet through previous encounters with it from other health publications, but we both initially felt that eating style to might be too restrictive (how wrong we were!). We quickly ordered Sisson’s book and started studying up on the primal lifestyle. Although I was never instructed to eliminate grains and refined sugars from my diet completely, I figured “Why go halfway?”. If it was part of the problem some of the time, wasn’t it part of the problem all of the time? I was a whole grain, low fat eater and I was making myself feel worse without knowing it! This book is a must have for anyone looking to improve their health and live a happier and more vibrant life. This book asks you to forget conventional wisdom and question what you think you know about diet and exercise. Sisson’s book is a very easy read and is quite entertaining! He compares and contrasts the lifestyle of a hunter-gather family and a modern day, suburban family. This really helps to drive home the importance of the Ten Primal Blueprint Laws which cover everything from what to eat, how to exercise, making time for play, and using your brain! He covers in great detail why grains, as a result of increased insulin production and toxic anti-nutrients, are leading us to higher rates of diabetes, so-called insidious weight gain, and heart disease. He discusses that there is little to no correlation between saturated fat intake and heart disease risk. The Framingham and Nurses Health studies provide some of the evidence for this assertion. As a side note, Alex and I have both seen improvements in our health that we did not expect. I have dealt with chronic eczema since childhood. Within weeks of changing my eating habits, I can say I was and still am nearly eczema free! Alex suffered from seasonal allergies and was very allergic to my Mom’s cats. He couldn’t mow the lawn or spend more then a few minutes at my parent’s house without sniffling or going into a sneezing fit! He has now made it through all four Michigan seasons with hardly a sneeze. We are now able to enjoy several hours of time at my parent’s house without worry that he will need to leave. He is not completely cured, but the difference is so dramatic, and we cannot attribute it to anything but a change in diet. The elimination of allergies is not an entirely uncommon occurrence when switching to a grain-free diet (2011 Paleo survey). It turns out that consuming the seeds of grasses is not such a good idea when you are allergic to grasses! As good as the Primal Blueprint is, it is not without a couple potential faults. Personally, we would prefer that Sisson devoted more effort to detailing the dangers of industrial seed oils and highlighted their contribution to modern diseases of civilization. In addition, Sisson’s main business is in developing and marketing various supplements. As such, he endorses their use in order to ensure micronutrient intake is adequate. Although he is quite forthcoming with his financial interest in supplementation, and we would never fault the guy for trying to make a buck, the efficacy of certain dietary supplements is questionable with some studies showing that they may not always work as intended. Whole foods are complex nutrient delivery systems that cannot necessarily be reduced to their constituent parts with the same outcome. We are by no means against supplements and still take a few ourselves. They certainly have their place in some situations and it’s incumbent on each person to do the research and decide if their unique situation demands extra nutritional support. In all, Sisson does a fantastic job of providing an overview of the most important factors to maintaining good health. The exercise portion of his book has inspired changes to our training styles that are at least as great as our dietary changes. 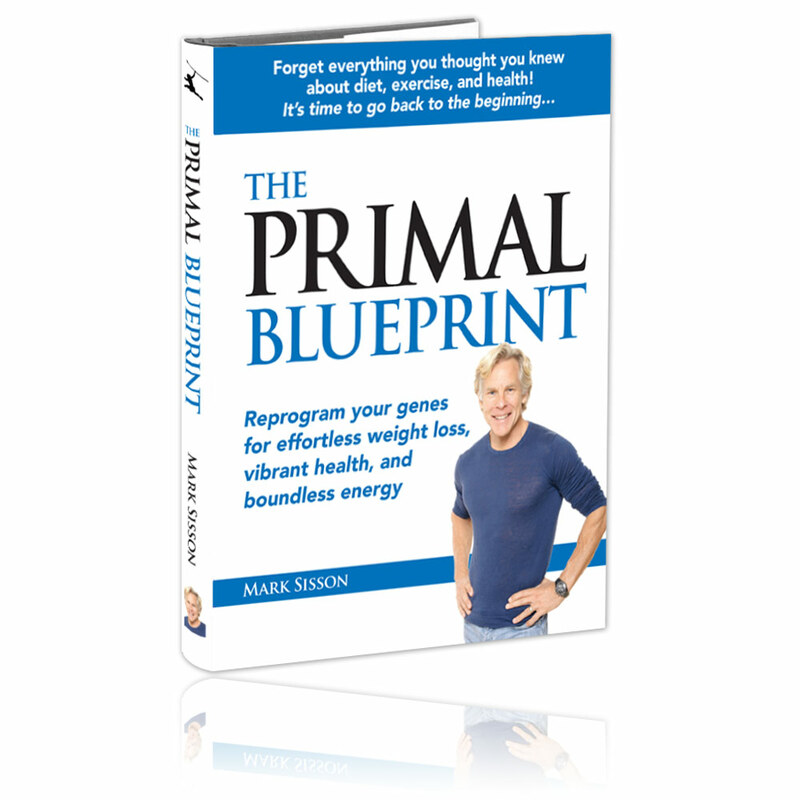 Excellent training guidelines are included in the book, but for specific programming information, Sisson has generously made his Primal Blueprint Fitness e-book available for free at http://www.marksdailyapple.com. In summary, The Primal Blueprint is not a “diet” book, but rather, a comprehensive manual that provides instructions on what is required to enable favorable gene expression and fully realize what it means to be a healthy human animal. I just finished reading this book. I started the primal diet a couple of months back after my girlfriend convinced me that it would help my bipolar symptoms. Wow! Was she right! I’m a believer in the primal way of life. It’s not a diet or a passing fad; it’s a life-change that makes so much sense for me. Along the way of learning about the primal way, I learned that depression is an inflammatory disorder. What causes inflammation in our bodies? Carbohydrates, of course! I was poisoning myself with every piece of bread and bowl of cereal I was consuming–no matter if it was whole grain or not. Eating right isn’t the only change I made. Routine exercise, meditation and regular sleep patterns have become the norm making insomnia, fatigue and stress a thing of the past. This book really does offer the tools one needs to change your life! I highly recommend it! I’m glad to hear you are feeling so much better! This book made such a difference in our lives and I’m so glad to hear it’s helping others! Why do I always hurt?